Producer and composer Rupert Hine first came to our attention as leader of the funk-fusion band Quantum Jump who released three albums in the 70s. A&M then signed him as a solo artist, and he made three highly individualistic albums for the label; Immunity (1981), Waving Not Drowning (1982), and The Wildest Wish To Fly (1983), cherry picked for this compilation. Already establishing himself as a producer, after his brief solo career he embarked on a long and still ongoing highly successful career working with artists as diverse as Rush and Tina Turner. 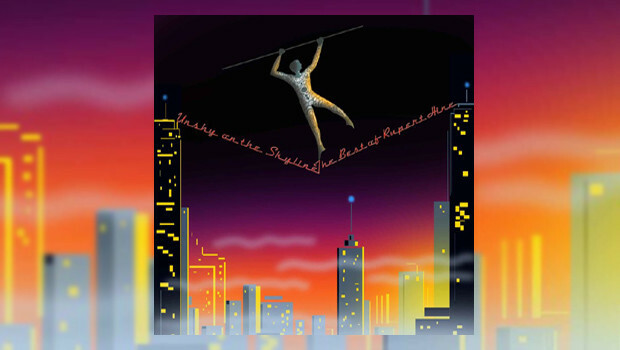 Taking its title Unshy on the Skyline from opening track the paranoia-laden I Hang On To My Vertigo the compilation is full of Hine’s innovative tunes, that although often backed with instantly identifiable 80s synth sounds uses those in a nonconformist way so as to make the music far more difficult to date. That can only be down to the strength of the songwriting and arrangements. The cover booklet opens with “The listener usually discovers Rupert Hine’s solo work in a serendipitous way” and that was true for me. If memory serves, and there is every chance it doesn’t, I first heard the mystical song Samsara on the radio, went to my local vinyl emporium and asked the guy something along the lines of “Who did a song called Samsara that sounds like Bowie practicing meditation?” Before I knew it I had purchased Hine’s then current solo album Immunity. That was 34 years ago (gulp! ), and it is an album I still occasionally return to, again because the songwriting acts like a magnet. Hine’s voice is reminiscent of Bowie in places, but I’m sure it was not a deliberate ploy. The music is restrained, sometimes minimalistic, with an ever-present slightly unsettling undercurrent. Aided by musical friends Phil Palmer playing guitar on selected tracks, Phil Collins, Marianne Faithful (not on this compilation), Geoffrey Richardson (not on this compilation), Robert Palmer and others, the end result has an accomplished sheen, filtered through Rupert’s and co-producer Stephen W, Tayler’s modernistic sensibilities, without being too obviously 80s in style. However the true star is artist-poet Jeanette-Thérèse Obstöj, whose lyrics, reprinted in full in the booklet are never less than interesting, often thought provoking. One of the tracks, Picture Phone, a single track only included on the USA issue of The Wildest Wish To Fly, highlights the concerns of man’s reliance on technology and the resultant ethical dilemmas, in particular video phones, some decades before they became a reality. Spooky! Unshy on the Skyline does not stick to a chronological order, but instead creates a cogent listen by linking moods and song tempos. The end result is a snapshot of the all too brief solo career of a highly talented individual who had the sense to surround himself with others of a similar high skill set, producing three quality albums in process that have stood the test of time well.